The Rock Inn is a 17th Century Inn that boasts five cask marque real ales, an extensive wine list and fantastic fresh food cooked with passion and flair served in either of our cosy fireside bars or bright and airy conservatory. Our food is made using only the best local produce, and is cooked to order by the team. To compliment our food, we try and keep 5 real ales on all year round. The usual suspects available are Tribute by St Austell, Sharpes Doombar and Timothy Taylor Landlord. We also regularly stock Otter Beers from Devon, Exmoor beers, as well as occasionally offering Wizard beers from Ilfracombe, and Barum beers from Pilton, Barnstaple. We also offer a fair selection of local cider. Our wines are hand picked, selected by Dan and Mark after hours of painstaking tasting sessions. The list holds 48 bins from around the globe and is ever changing. Almost every wine is available by the glass so that everyone can enjoy their favourite tipple without the expense of a whole bottle. 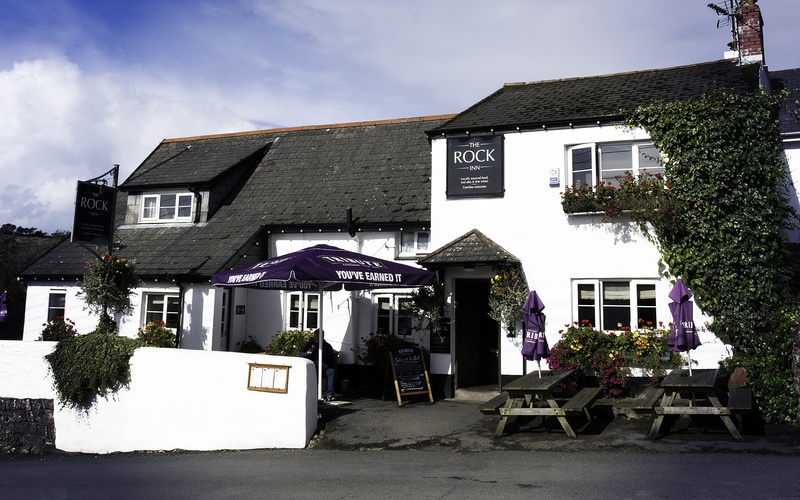 The Rock Inn is a wonderful family friendly pub situated in Braunton, the north Devon coastline. We serve a variety of lunchtime and evening meals, all made using fresh local produce and cooked to order by the team. In addition to our wide selection of local ales, we also offer a fair selection of local cider. Our wine list holds 48 bins from around the globe and is ever changing.